Pomorie Grand Hotel (ex. 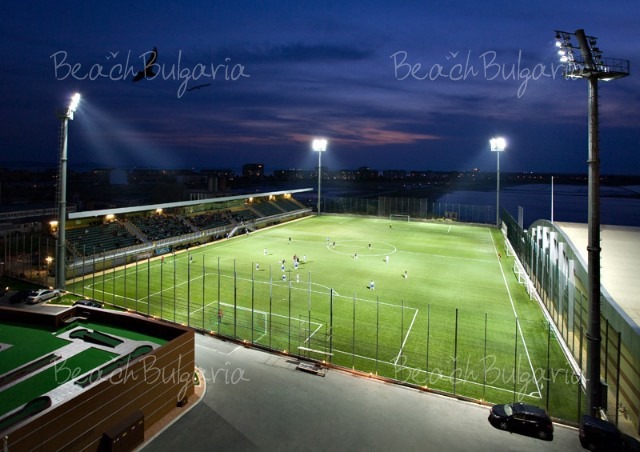 Balneohotel Pomorie) is situated between the shores of the Black sea and the Pomorie salt lake on the north-eastern part of Pomorie, at 15 minutes driving distance from the International Airport of Burgas and Sunny Beach resort. 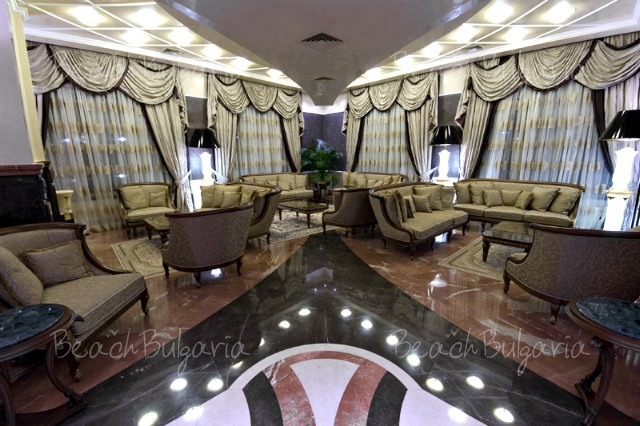 The hotel features 70 single rooms, 80 double rooms, 4 rooms for people with disabilities, 19 suites and 2 presidential suites. The guestrooms offer TV, free internet access, games, telephone, 24-hour room service, minibar, bathroom with a bathtub and shower, hair dryer, coffee and tea set, terrace with sea and park view. The SPA centre offers Russian sauna, Finnish sauna, ice room, steam room, Turkish bath, Kneipp walk, therapies, Mud and Lye treatment, Hydrotherapy, Physiotherapy, Kinesitherapy, Cosmetics, Massages, Laser therapy, Transcomtherapy, Magnetotherapy. There are 5 swimming pools – 3 open-air swimming pools in the park, one of them is heated during the winter season and is connected with a Jacuzzi /for 16 persons/ and a swimming pool for children, located inside the hotel. The hotel offers a swimming pool with salt water from the Pomorie spring. The water comes from 70 m under the surface and is 7 times saltier than the water of the Black sea. 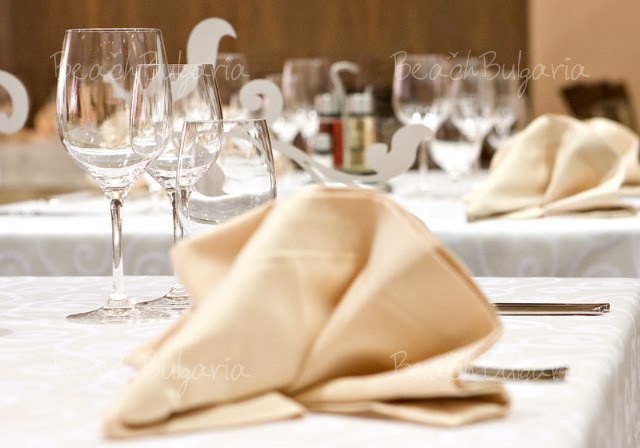 Main restaurant /200 seats/ with a summer garden /100 seats/ serves dishes from the Bulgarian and Mediterranean cuisine. Capitol Restaurant is a dietary restaurant with a daily menu, specially prepared by dieticians. At guests' disposal are Lobby bar, Barbecue, Sky bar, Beach bar, Pool bar and Fresh bar. There are several halls different in capacity, distribution and function. 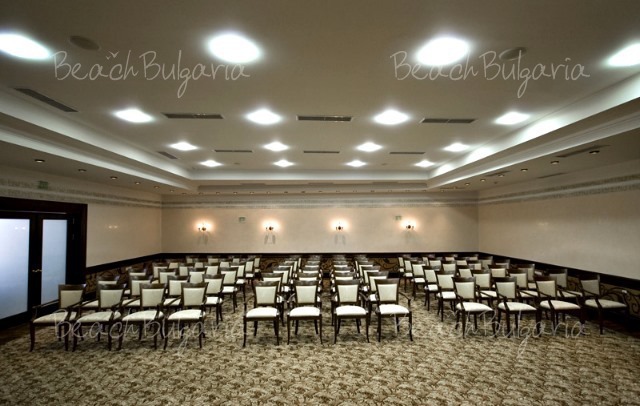 They offer excellent conditions for holding seminars, business meetings or other events. The complex features a football stadium, halls for aerobics and fitness and multipurpose sports hall. 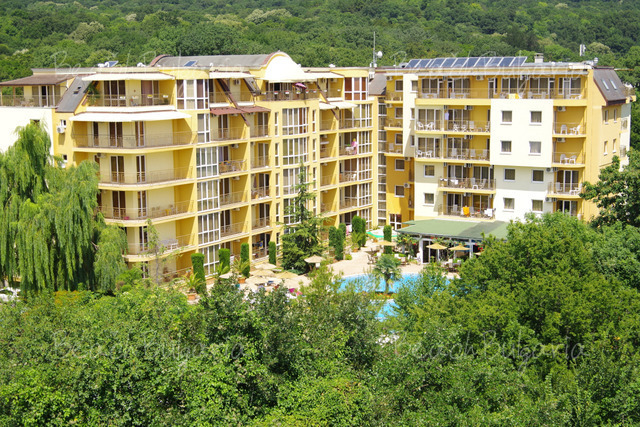 *All prices in Euro, per apartment, per night, breakfast included. Guests of the hotel can use indoor and outdoor swimming pool, sunbed and parasol near the pool, fitness, sauna, russian bath, turkish and steam bath, kneipp walk, ice room, relax room, parking, safe, Wi-Fi for free. * Cancellations can be made free of charge providing details of this are received at least 7 days prior to check-in time on the day of arrival and 14 days during 11 July - 24 August 2019 - cancellations made after this period will incur a fee equivalent to the cost of 3 night's accommodation. 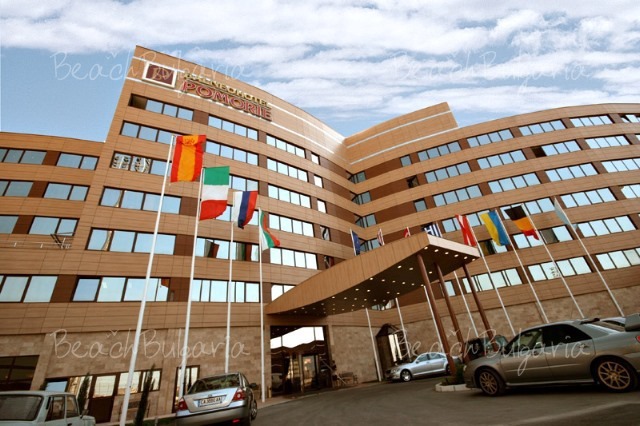 Please, post a comment on Grand Hotel Pomorie. Food very insufficient and poor. We had a very good holiday. Thanks. My first booking with BeachBulgaria.com in February was excellent, but the second one for September with Boryana was not so smooth and easy. We are going to book our next holiday with the company anyway and we believe that the service will be improved. Most of the hotel staff does not speak English and that was a big problem for me. We were impressed by the hotel. The food was excellent and the hotel staff was very friendly. We are planning to stay in the hotel Pomorie again next year. - 7=6, 14=12 for arrivals during the period 01 May - 31 May 2019 and 01 Oct - 31 Oct 2019. - 20 % discount until 30 April 2019!